I started working on my drawing skills a couple of years ago as a “middle aged” woman. You can read more about me on the rest of my website, but I’ve only had one art class and that was MANY years ago when I was in college. When I started buying books and drawing more, I fell in love with it. I am still a beginner, but I like to think that I am an upper level beginner. 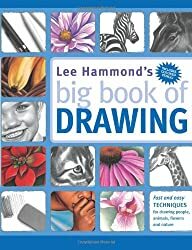 “Lee Hammond’s big book of Drawing” is one of the books I bought early in my learning stage. I’ve included my personal review of the book and some of the pictures I drew as I learned from it. As a professional artist and art teacher, Lee Hammond shows her deep love for art. She has owns/runs her own school of art and has published many books to teach others art and drawing techniques. In this particular book her subjects are mostly people, animals, and flowers. She does an excellent job of teaching appropriate proportion when drawing people and animals. (Something I struggle with.) In this book Ms. Hammond introduces a variety of pencils and colored pencils, as well as various drawing paper textures and colors. Ms. Hammond uses a technique of taking a photo of an item, and drawing a squared graph over it. She will then recreate the photo by drawing each section of the graph. In fact, the first lesson in the book is a photo that has been cut into the square graph, numbered, and then mixed up. Your job is to draw the sections in the graph in order and end up with the correct picture. It was an eye opening experience for me. I had done those kinds of drawing puzzles as a child, but when I tried to do it as an adult I was embarrassed at how bad my final picture was. Ms. Hammond made her point clearly – you have to practice seeing the object and drawing what you really see. I learned a lot about how to look at an object. My drawing of a human eye. This book is written for the more advanced beginner, but not necessarily for children. I found it to be a little difficult for me to understand without referring back to my simpler resources. Don’t get me wrong here. I like the book very much. It is an excellent resource. I was amazed at the things I was able to draw! I’m not a huge fan of drawing the human body, but I found out I really like drawing eyes. Eyes are full of fun challenges and every eye is different. This eye was one of my very first I drew. This book is great for teens or adults and young adults who have some previous drawing instruction. I really like her books. Maybe I’m just a little on the slower side of understanding terms and techniques, but I would strongly recommend it as an early addition to a learner’s library, just perhaps not for the beginner’s first book. I found out that I do much better with non-breathing objects. I tried very hard to follow Ms. Hammond’s steps and draw people and animals. It remains a major challenge for me. I won’t give up. It will just take me a long time to accomplish an acceptable level of skill with those. I’m afraid my drawing of my cat may always stay in my hidden files! I did much better with the flowers. I continue to use this book. As I learn and my skills increase, I get more out it. I refer to it often now. Another one of those things I need to keep working on. My final opinion of “Lee Hammond’s big book of DRAWING” is a very positive one. Sometimes it can be a little lacking detail for a beginner, but as a continuing learner it is a great addition. I would recommend it. I included the link to purchase the book if you go back up to the top and click on the picture of the book or on the Amazon name in the product facts. It’s a very helpful resource. I hope you enjoy it.